When you’re next out for a stroll or a picnic in the Stillington Forest Park, why not take advantage of the new benches dotted around. A taste of Last Of The Summer Wine came to Stillington in the guise of Jonathan Linsley who played Crusher Milburn in the long running TV series, He met Stillington's answer to Foggy and Clegg when he was introduced to Ron Cowley and Frank Hodgson in the Forest Park. They were there to meet the three apprentices of Stillington based firm Darchem Engineering (Esterline). Jonathan said 'The workmanship is excellent and the generosity of the company in donating these seats to Stillington for the park is fantastic. The apprentices and Darchem should be very proud of themselves'. Ron and Frank agreed saying the seats were perfect places to sit, reminisce and plan more mischief. The six benches were made by apprentices of Stillington based firm Darchem Engineering (Esterline) Darchem donated the benches to the Parish Council as part of their support to Stillington community projects and in a team effort Stockton Borough Council did the installation. 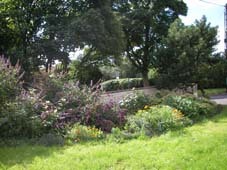 In April 2007 Stillington and Whitton Parish Council was awarded just over £5000 from Awards for All to improve Cassidi Gardens and other open spaces in the Village. By July new paving, seating and a central stone circle had been installed in Cassidi Gardens by local firm Total Care Solutions who also contributed to the project. Volunteers planted up the flower beds that have been created with help from the Community Payback teams who also painted the walls. Other projects funded by the grant include installing wooden planters throughout Stillington and Whitton built for us by Anthony Naisbitt and looked after by residents, bulb planting and plants for Chapel Gardens. The money has also been used to buy tools to manage the wildflower meadow at the edge of the West Street Playing Field. The money awarded to Stillington in the Tees Valley Village of the Year Competition 2006 was used to help fund some aspects of these projects.